Regular readers around here know that Geoff and I are huge fans of The Bloggess. We also happen to think that Neil Gaiman is pretty awesome and that Amanda Palmer is pretty cool. I signed up to work an event featuring Nick Flynn and Ty Burr and who was more surprised than me when Amanda Palmer and Neil Gaiman showed up? Bloggess? This is for you. Nick Flynn and Ty Burr were great and highly entertaining and were originally the only two scheduled on the docket for the evening. Apparently Nick Flynn and Amanda Palmer are friends and so there had been some discussion on Twitter the day before about her dropping by and performing. We, the staff running the event, had only heard rumors about this and so we weren’t sure what to expect. That was the first song. She sang totally without a mic, as you can probably tell from the video. I shot the video on my cell phone from the back of the room where I was working (sorry). The most amazing thing is that she was totally spellbinding from the word go. She sang like it was her last performance on earth and like she had to put everything into it. Like there’d never be another song. And then, after the Nick Flynn/Ty Burr discussion was over, she did it again. I learned a lot, as a performer, just from watching her. I’m still thinking about it. After it was all over, she and Neil Gaiman graciously signed a bookmark of mine. They were so sweet to chat with me for a few minutes on their way out. I may have fangirled them a bit, but I am SO glad I did, and so grateful that they were kind and willing to talk to me. 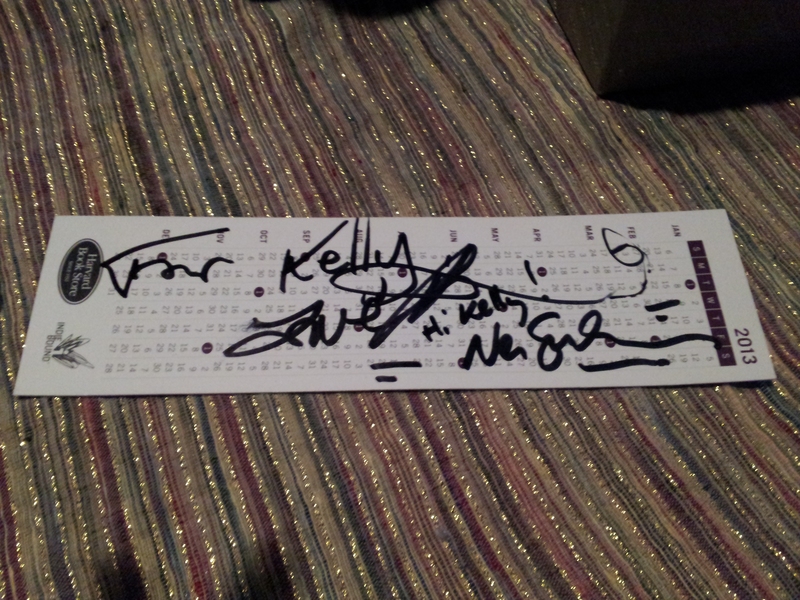 This is a Harvard Book Store bookmark signed by Amanda Palmer & Neil Gaiman. It’s on my shelf next to my safety goggles signed by the Mythbusters. Yes, really. That was, without a doubt, one of the most interesting evenings of my working life. HOW COOL. I’m way jealous of your experience. Awesome reading! Thank you! We, the staff, were all sort of looking at each other and shaking our heads in disbelief. It was a great night.